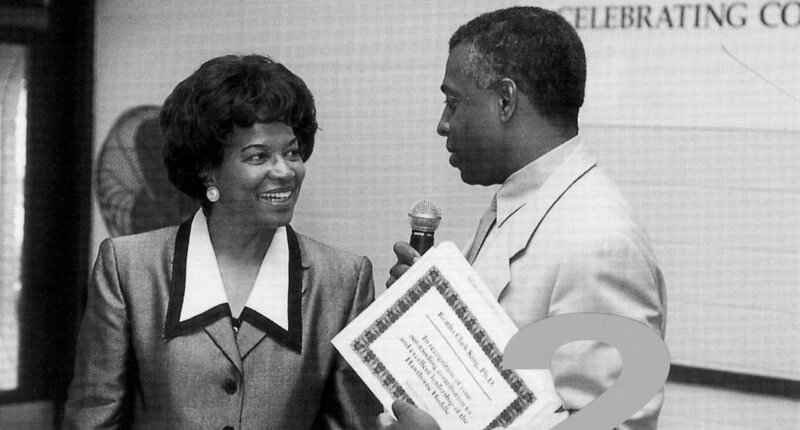 US Attorney for Minnesota Todd Jones presents former longtime Hawthorne Huddle leader Reatha Clark King with an award of appreciation in 1999. Photo courtesy of the General Mills Archives. The monthly community meeting has garnered national attention for its success connecting people, bringing down crime, and creating better living conditions in the neighborhood. Hawthorne block clubs mobilized in response to the challenges, and by 1997, members of them, supported by the General Mills Foundation, banded together to do something big. In the years since, residents, community leaders, and the foundation have tackled crime, improved housing, and helped create assets in Hawthorne, like Nellie Stone Johnson School. A central component to their work was a monthly meeting to discuss what was happening in the community – the Hawthorne Huddle. Now, two decades later, that group and those who have joined them and benefited from their work will celebrate their successes at the 20th Anniversary Celebration of the Hawthorne Huddle on Thursday morning, Dec. 7. Founding community members Hillary Freeman, Diana Hawkins, Dave Ellis, Loretta Ellis, Richard Spratt, and Paula Haywood will all be honored that day. Early leaders of the huddle, Reatha Clark King and Pastor Floyd Beecham Sr, will also be honored. US Attorney General Janet Reno visited the Hawthorne Huddle on April 21, 1999. Photo courtesy of the General Mills Archives. The Huddle is an open-to-the-public meeting that has taken place on the first Thursday of every month since its inception. It first took place at the Village Social Service. Now it takes place at Farview Park Rec Center. Elected officials, educators, social service professionals, law enforcement representatives, faith leaders, and residents meet to exchange information, discuss shared goals for the neighborhood and take action. Whether it’s a humid summer morning in July or a dark, frigid morning in January, the crowd of attendees is always sizeable and often includes a well-known public figure or two. MPS Superintendent Ed Graff attended last month’s Huddle, and historic attendees have included former US Attorney General Janet Reno, former US Vice President Walter Mondale, and current Minnesota Governor Mark Dayton. These days, the meetings are lead by Ann DeGroot, executive director of the Minneapolis Youth Coordinating Board (YCB) and Diana Hawkins, executive director of the Hawthorne Neighborhood Council. Hawkins was among the founding members of the group. “The goal of the Huddle was to bring people together to talk about change in the community,” she said. Reatha Clark King, retired corporate executive and the former President, Executive Director, and Chairman of the Board of Trustees of the General Mills Foundation, was instrumental in the successes of the Huddle. General Mills was interested in helping reduce crime and increase safety in the mid 90s. Hawthorne’s struggles, along with its proximity to the General Mills headquarters made it an attractive community for the company to focus on. “It’s part of the company’s culture. It was committed to community service and action to improve the lives of people in communities,” said King, who reminisced about General Mills employees from the Betty Crocker Division helping build the playground at Nellie Stone Johnson School. King says General Mills’ involvement as a philanthropic partner has been unique. For over a decade she prioritized building trust in the community. Though General Mills offered financial support to the community, forming and fostering enduring relationships that had the potential to create sustainable change was King’s priority. “We were not quick to make grants unless we saw the plan and knew why money would help solve the problem. Grant-making can be a short-term solution. That’s the easiest thing to do. The problem solving is the hardest part. That comes from conversation and follow-up without delay,” she said. The model for the Huddle and General Mills’ support of Hawthorne was unique. “We can say we did it from scratch. We didn’t have a template or a model to follow or another best practice,” King said. Harvard University thought so as well. When King announced her retirement in 2002, after over a decade of work in Hawthorne, they did a case study about the Huddle, helping it arrive at a plan for leadership after King’s departure. Claudine Galloway, a communications manager for the General Mills Foundation, says the organization plans to continue to support the Hawthorne Huddle into its future, specifically directed to the YCB which currently stewards the funds. Hawkins hopes the Huddle continues “the success that we have achieved so far,” and “pave[s] the way for new leaders,” to carry it forward.